Call us today for 10% off electrical work. Choice Electrical Service of Merritt Island, FL is proud of our years of service to Cocoa, FL and Brevard County. We look forward to helping you with all your electrical needs. We serve residential and commercial customers. Our licensed master electrician is prepared to help you with the sales, service and installation of the electrical system that is ideal for your home or business at affordable rates. We believe that offering quality, prompt service and solving our customer's electrical problems is the only way to run a business. We are a state licensed electrical contractor and our master electrician provides the electrical work expertise you can depend on. The electrical contractors from Choice Electrical are always at the top of their game. They are very knowledgeable and fully trained when it comes to every aspect of residential and commercial electrical work. To receive your initial quote, please call today! Electrical wiring is something customers don't want to handle on their own. What might seem like an easy fix can quickly turn into an extensive electrical repair. Without proper training in electrical work, this will surely become a problem. Choice Electric has been handling electrical jobs for commercial and residential clients for years. Quality service for a great price, that's what you get from us. Always. From common problems to new wiring in your home, the electrical contractors of Choice Electrical are up for the challenge. Before you hire any electrician, contact us directly for an estimate! Count On Our Electrical Contractors for Electrical Wiring and More. 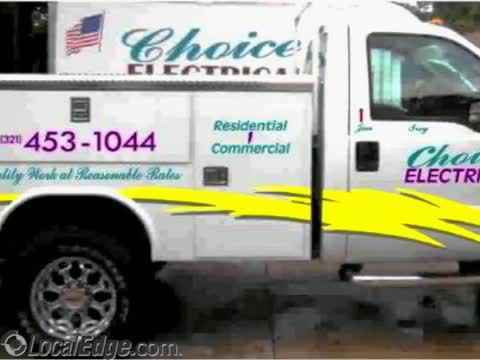 At Choice Electrical Services, we do electrical work and repair on electrical wiring, panels, FPL meter cans, remodels, docks and pools, pumps, generators, fans, landscape lighting, commercial signs and all types of lighting and outlets. We also provide insurance inspections. When it comes to your family, you want dependable electrical wiring and systems that provide you with safety and reliability. We take pride on being on time and cleaning up after ourselves. Your continued satisfaction is our highest priority. We know choosing an electrician service company in Cocoa, FL can sometimes be a tedious task, maybe even a bit daunting. But that's why our electrical contractors bring the best in repair and installation to your home or business and we stand by all of our work. Our staff of highly qualified electrical contractors have years of industry experience. Because of this, we've managed to maintain a highly positive customer satisfaction rate and we intend to keep it this way. All of our electrical contractors are highly skilled and experienced to handle both residential and commercial problems that can come up. No matter what type of electrical work you may need, you can be confident that it will be handled with precise skill and determination. To hire a great electrical contractor to take care of all of your work, the choice is simple. Choice Electrical leads the way in high quality, precise electrical work for residential and commercial customers. Don't call just any electrical contractor. Call one that has a great reputation behind them. Call Choice Electrical today. Whenever you need high quality electrical work done right, Choice Electrical is the business to call. Our electrical contractors are very skilled in all areas of work and look forward to serving the customers of Cocoa, FL. No electrical job is too much for them to handle! We perform commercial and residential electrical work throughout the Cocoa, FL area. If you are looking for an electrical contractor that comes at an affordable price, choose Choice Electrical. We guarantee you will be satisfied with your service. Call us today for more information! If you are looking for an electrical contractor to perform commercial or residential electrical work, or if it is time to remodel your bathroom or kitchen, Choice Electrical Service is ready to take on the task. We provide exemplary electrical services in Cocoa, FL and throughout all of Brevard County. Choice Electrical Service is committed to ensuring safety and optimal performance of the electrical systems within your home or business, whether it be through preventive maintenance or rewiring of your existing system, or by installing a new system that will be safe and efficient. Our goal is to provide the very best in sales, service, installation and maintenance. Our quality control standards are high and all of our employees are trained to meet these standards. Our master electrician is among the best in the business and our goal is to always deliver honest and reliable service. We want you, our valued customer, to be happy. Specializing in kitchen, bathroom remodeling and electrical problems: No power sparks, low voltage. We upgrade devices & light fixtures, wall sconces, chandeliers & panels. "We Treat Your Home Like It Is Ours"
Lighting, service panels, electrical upgrade, electrical remodeling, electrical construction. Residential electrician, commercial electrician, mobile homes, panel repairs, FPL meter cans, bathroom remodels, kitchen remodels, additions, signs, electrical rewiring, electrical repairs, pumps, fans, landscape lighting, docks & pools, generator hook ups, lights/outlets, insurance inspections.